Inspired by the rural agrarian landscape in the central Willamette Valley of Oregon where he was raised, his experience living in Texas, New Mexico and upstate New York provided him with source material that broadened his view of the American landscape. 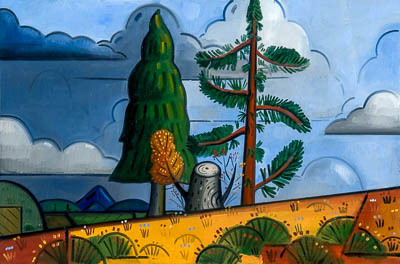 Though his work is inspired by early 20th century European and American modernists who, like Thompson, loved and honored the landscape in which they lived, his painting style embraces a Pop Art sensibility, with a Roy Lichtenstein-like iconography that renders the paintings distinctly contemporary. Thompson is a real painter. He knows how to use color, line, and a sheer, seamlessly integrated, flat surface to eloquently express his feelings about the landscape. The lovely paint quality he achieves provides the work with a life force that does not communicate as well in a digital image. His drawings, too, possess an innate energy. Working traditionally through drawing as an expedient vehicle to explore ideas about his subject, he works as brilliantly in black and white as he does in color.